The area around Bryce National Park has many attractions including cultural, historic and natural highlights. 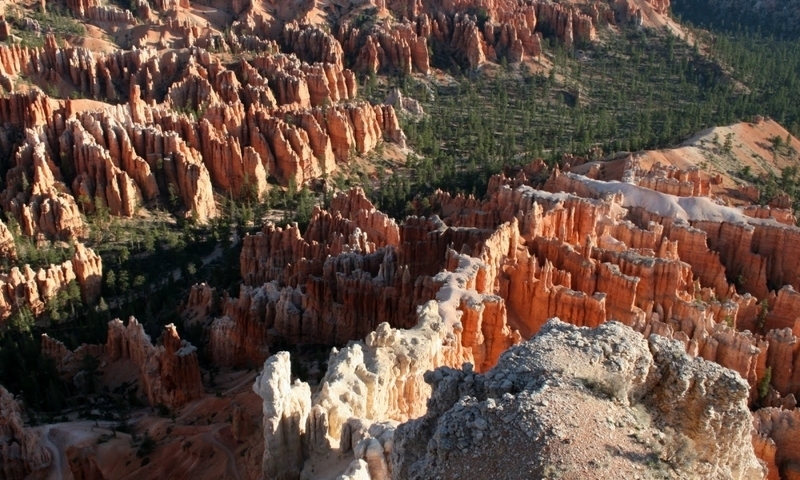 The area around Bryce Canyon National Park in South Utah has an amazingly diverse number of attractions. Bryce Canyon tourism attracts over a million tourists each year to see the red rock formations and discover the walking trails, mountain scenery and wildlife in this unspoilt area. The 18-mile Hwy 63 runs from Bryce Canyon Visitor Center to Rainbow Point with many viewpoints and trailheads along the way. See the Natural Bridge, Mossy Cave and the stunning amphitheaters filled with red rock hoodoos in this breathtaking natural wonder. Bryce Canyon is the best known national park in the area, but Calf Creek with its scenic waterfall and the Three Peaks Recreation Area all offer great natural scenery and opportunities for outdoor activities. Southern Utah has many rivers and lakes offering fishing, boating, swimming, water skiing and other watersports. Visit Navajo Lake, Panguitch Lake, Tropic Reservoir, Sevier River, Pine Lake and the East Virgin River for great activities in quiet surroundings. The easiest way to see the many attractions around Bryce Canyon National Park is by taking scenic drives. Enjoy routes such as the Burr Trail Road, Highway 12, Cottonwood Canyon Road, Griffin Top Road and Highway 14 in the Utah sunshine. Hole-in-the-Rock Road and Smoky Mountain Road also offer some picturesque and unique scenery. This top snow sports resort at over 11,300 feet offers first-rate snow and a range of amenities for the whole family. It has 640 ski-able acres along with its snowboarding and tubing fun parks. In the summer there is still plenty of fun to be had at Brian Head Resort with hiking trails, biking and ATVing amidst glorious mountain scenery. Cedar City tourism has plenty of historical attractions such as the Daughters of Utah Pioneers Museum with its unique exhibits, the Frontier Homestead Museum, Old Irontown Ruins and SUU Museum of Natural History. Take a trip to see the Parowan Gap Petroglyphs or take the family to the Paunsaugunt Western Wildlife Museum for some memorable days out whilst staying in the Historic Downtown Cedar City. Southern Utah has some spectacular mountains offering dramatic sights such as the Aquarius Plateau and the Paunsaugunt Plateau, visible from Bryce Canyon National Park. Enjoy the fall colors at Cedar Mountain or explore Boulder Mountain, Hurricane Cliffs and the wildlife in the Escalante Mountains and the Markagunt Plateau, home to the Brian Head ski resort. This huge geological wonder draws many visitors to see its pristine natural beauty. It offers a host of outdoor activities from hiking and horseback riding to ATVing and mountain biking. Utah's natural beauty does not end with Bryce Canyon. The extensive Dixie National Forest, Box-Death Hollow Wilderness and Escalante Slot Canyons make great places to visit and enjoy hiking. Features such as Mammoth Cave and Springs and Grosvenor Arch are unique sights amidst this beautiful area of mountains, lakes and national parks. As well as viewing Bryce Canyon from the park road, consider taking one of the trails and exploring Red Canyon and Parowan Canyon to discover more of Utah's scenic natural beauty at close quarters.